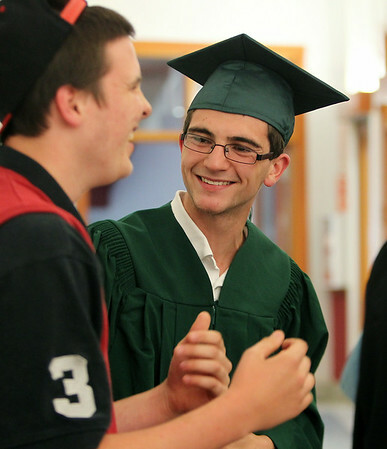 Essex Aggie graduate RJ Conroy, right, greets his friend Matt Slauter, left, with a hug and smile prior to the start of the final Commencement ceremony for the Essex Agricultural and Technical High School. Next year Essex Aggie and North Shore Technical High School will combine into one school. DAVID LE/Staff photo. 6/5/14.